As with all destinations, there are many paths to healing. Sometimes we go looking for a cure and end up finding healing in the process. This weekend, I had the pleasure of watching Phil Volker come to this knowledge in the film “Phil’s Camino”. For 20 of the past 22 years, I have attended the Hot Springs Documentary Film Festival in Hot Springs, Arkansas. Last year, two of the festival’s features were colored by our producer, James Honaker. Every year, I come away feeling more alive, more connected, more knowledgeable, and more inspired. It would be impossible to view “Phil’s Camino” without feeling inspired. In the film, Phil walks the 500 mile El Camino de Santiago Trail in Spain after a colon cancer relapse that has brought him to stage IV cancer with numerous tumors in his lungs. He makes the trek in the 28 days between chemotherapy treatments. Giving you this synopsis makes it sound as though he struggles or trudges through a challenge. While he does pass out in one scene, it never feels as though he’s struggling. Instead, what shines through is the incredible fullness of life he’s experiencing in each moment. Phil came to walk the Camino in a way that many of us would dismiss or overlook. He was diagnosed with cancer in 2011. He discovered the Camino in 2012. At that point, the idea of traveling to Spain and walking 500 miles seemed like a pipe dream. He could have given up his impossible idea to focus on seeking a cure for his illness. Instead, Phil decided to follow his dream at an achievable scale. With the help of an engineer, he mapped out a half-mile track on his 10 acre farm. Using maps of El Camino de Santiago, he walked every day and charted where he would be if he were walking the actual pathway in Spain. As he walked, others joined him. He forged new friendships, renewed existing relationships, and gained a richer perspective on life. He grew stronger. In 2014, as he neared the completion of the Camino on his property, Phil felt strong enough to ask his doctor whether it would be possible to travel to Spain to walk El Camino de Santiago. With the condition of a favorable scan, his doctor consented to the trip. Soon after, Phil had a favorable scan. 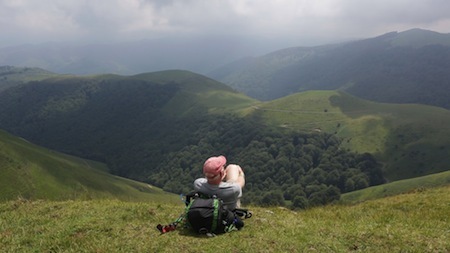 The next day, he boarded a plane to walk 500 miles with a friend and a backpack. His wife stayed at home on the island. Phil says that while he prefers vacations with challenges, his wife prefers vacations rolled in warm butter. Through all this walking, Phil recognized that while he was not cured, he had found healing. It began with him scaling his dream to a size that fit his circumstances and continued through his pursuit of that dream one step at a time. It might have been easier for him to dismiss the dream or give up living to fight his illness. Many of us have dismissed our dreams in far less dire circumstances. But if he had made that choice, we would have all missed out. Phil sat on a stage in front of me Sunday looking whole and happy. His story has not yet ended. And when it does, his example will live on to inspire us. That’s how it is when we walk a path we know at our core we are meant to follow. Whether our journey down that path is long or short, our lives are automatically richer and more meaningful. And we inherently make a difference. I wish us all the courage to follow Phil’s example and find our own path to healing. In healing ourselves, we heal the world.